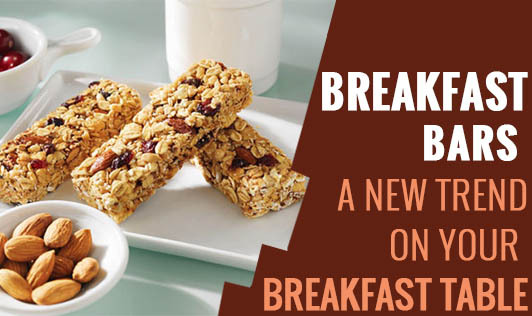 Breakfast Bars - A New Trend on Your Breakfast Table? We have come a long way in changing our breakfast options, from traditional idly, sambar, dosa, upma and poha to cornflakes, oats, muesli etc. Now, here are a new breakfast substitute- breakfast bars and granola bars. It is tasty, crunchy, and chewy and can be eaten at anytime of the day. Breakfast bars are made of whole wheat, oats, fruits, dry fruits and berries. Each pack contains about 6 bars which are of 25 to 50g and each costing about 120 - 180 rupees. Ingredients for cereal bars are enriched, bleached wheat flour, sugar, corn syrup, palm oil, high fructose corn syrup, evaporated apples, modified food starch, whole wheat flour, wheat bran, calcium carbonate, natural and artificial flavours, oats, salt, and caramel colour. Sometimes, wheat and soy are also added with some traces of peanuts and tree nuts. These bars are easy to carry to your office and buying this will be a good idea. Conveniences aside, how healthy are these options? The ingredients include added flavours, binding agents and high fructose corn syrup which are unnecessary ingredients at a breakfast table. A pack contains about 6 granola bars, each bar weighing about 25-30g with a cost of 20 -30 rupees each. So, let's consider this. If you are eating 1 bar each day, either for your breakfast or as a snack, it would cost you around 480 to 720 rupees a month which is way too expensive. Of course, this would depend on the brand that you would buy and the number of bars you have. Talking about its nutrition, each bar (per serving) contains about 130Kcal, 1.4g of protein, 1.7g of fat, 1.3 g of fiber, and 21g of carbohydrate of which 11g of sugar. Calories in idly, dosa, upma, poha cornflakes, and muesli are same as any breakfast bar and contain more vitamins and minerals due to its added herbs and spices. Breakfast bars are costlier than any of our breakfast or snack options. Added to this are preservatives and flavours to the bars which are not healthy and not advised by any health expert. Even our traditional breakfast can match the other nutrients such as protein, fats, fiber and carbohydrate of a breakfast bar. I do not feel anything special about them other than their convenience. A fruit, a box of dry fruits, roasted channa, and roasted chivda are also easy to carry. Breakfast bars are not filling too. You may have to depend on another meal/snack which would in turn, increase your unnecessary calorie and fat intake. As said earlier, breakfast bars contain wheat, oat and fruits that you can as well eat with cornflakes or any other form of our Indian breakfast. Upma with vegetables and curds, poha with peas and curds, vegetable parata with curds, egg white omelette with mint chutney, vegetable grilled sandwich etc are good examples of wholesome breakfast options. Do not fall for the marketing skills of these companies. They only concentrate on selling the new products and the profit from the same. Contact your dietitian for more healthy breakfast options. You can also take the help of our experts to review your current breakfast options to make it a healthy breakfast. Please go to "tools -> recipe make over" to add some health to your recipe!